I guess you could call this a "near miss"? PublishedJan. 24, 2019, 11:35 p.m. 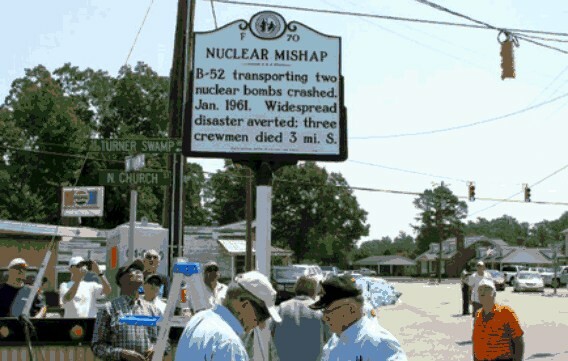 The event, known as the North Carolina Incident or the 1961 Goldsboro B-52 crash, was a broken arrow incident on US soil. The term broken arrow, per Wikipedia, “refers to an accidental event that involves nuclear weapons, warheads or components that does not create a risk of nuclear war”. There have been several such incidents, but the NC Broken Arrow incident is a truly fascinating one. The aircraft, a B-52G, was based at Seymour Johnson Air Force Base in Goldsboro. Around midnight on January 23–24, 1961, the bomber had a rendezvous with a tanker for aerial refueling. 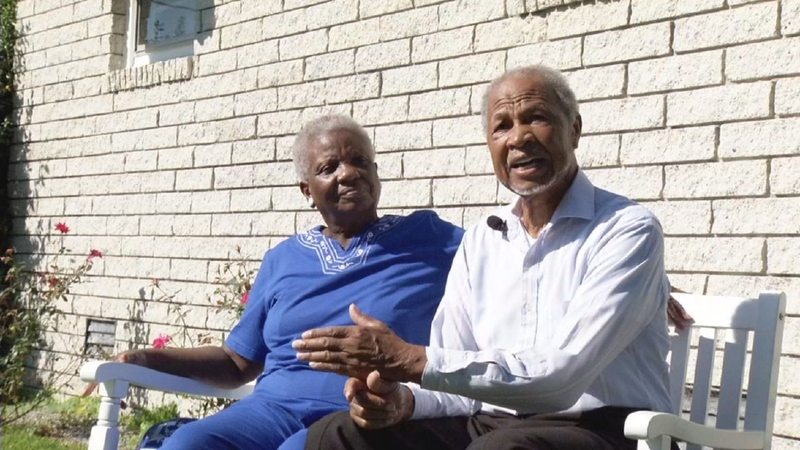 During the hook-up, the tanker crew advised the B-52 aircraft commander, Major Walter Scott Tulloch, that his aircraft had a fuel leak in the right wing. In this time period a fuel leak would be treated with burning as much fuel as possible followed by a safe descent. The fuel burn is to prevent the risk of a spill fire or outright detonation as the plane lowers itself to safety. Unfortunately, while moving to the holding pattern Major Tulloch noticed a rapid drop in fuel as 37,000 lbs were lost in the span of 3 minutes. The B-52 needed to come in, and it was coming in hard. Col Adam Mattocks (ret.) is the last survivor of the incident. He is also, for those keeping track, the only man to bail through the top hatch of a B-52 without an ejection seat. The flight crew was told to abandon at 9,000 feet, with their last view of the craft being a breakup around 1,000 feet above the Carolina countryside. Two men went down with the craft, doing their best to guide the wreckage away from habitation, while another died in the parachute descent. 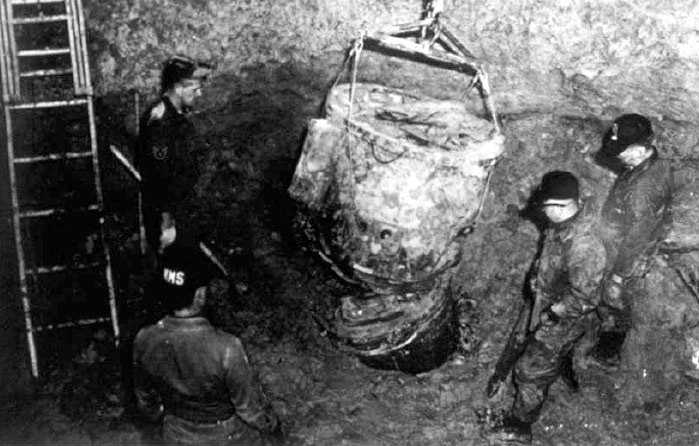 In its breakup were 2 Mark 39 thermonuclear bombs, with a payload of 4 megatons each. 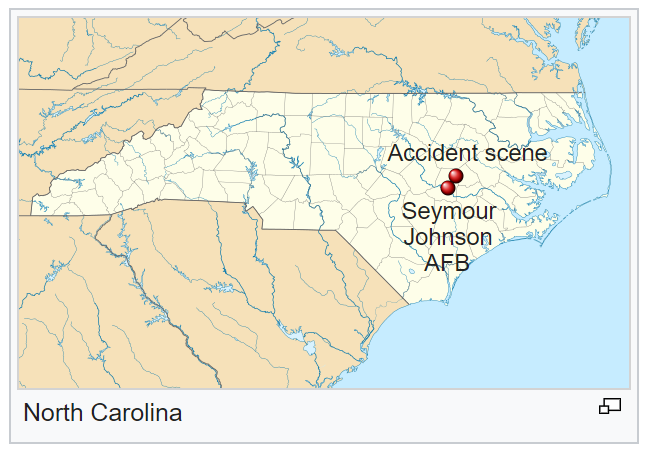 Recovery operations were dispatched from Seymour Johnson. The first bomb was discovered in a tree. The second was buried so far in the earth, with so much groundwater preventing full removal, that the Army Corps of Engineers purchased a 400 ft easement around the bomb, build a concrete encasement, and called it a day. Thankfully, they remembered to remove the core of the bomb, preventing spontaneous detonation at a later date. The aircraft wreckage covered a 2-square-mile (5.2 km2) area of tobacco and cotton farmland at Faro, about 12 miles (19 km) north of Goldsboro. The town of Eureka has taken on a certain morbid pride about the incident, and there are signposts directing nuke enthusiasts to the major sites. It’s a minor tourist attraction and helps out an impoverished area. However, the townsfolk never knew how close they were to death. In documents declassified in 2013, the first bomb was found armed, with all but 1 of its failsafes triggered. Had the bomb connected with the ground it would have detonated. 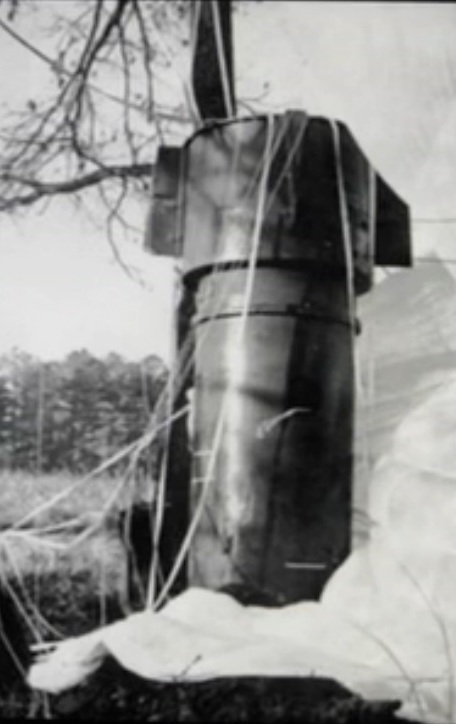 On the other hand the second bomb, armed when leaving the craft, was prevented from explosion due to debris from its unceremonious landing lodging in a single arming circuit preventing its closure. And so it was by dumb luck that the area and its 60,000 residents were spared. Had either bomb gone off a 15 mile radius of thermal energy would have cooked any living thing, collapsing buildings in a sonic boom up to 8 miles from the blast radius. A similar blast would kill 4 million if it occurred in Manhattan. The event changed how the US military saw the B-52 in its role as a support bomber. Wet wings (wings with integral fuel tanks like this one) considerably increased the fuel capacity of B-52G and H models but were found to be experiencing 60% more stress during flight than did the wings of older models. Due to the incident wings were redesigned, and the Mk 39 were recommended for decommissioning, though it was included in the later Convair B-58 as a fuel/bomb hybrid pod. So what have we learned today? Plenty. Goldsboro was a wakeup call to the military and its handling of nuclear weapons on domestic soil, and helped to refit the B-52 to continue its run as the bomber of choice for its class. It also shows us that, sometimes, blind luck is all that stands between you and not waking up in the morning. Want to share a story inspired by this?